An architect is a professional and expert in their field. Through their knowledge and experience, your architect can save you both time and money, and also give you peace of mind by taking the stress out of the whole building process. Your architect can also maximise your return on investment by adding value to your project. 2. What does C&K Architecture do? C&K Architecture offers a fully integrated service from concept to project completion including architectural design, interior design and development management. 3. What type of architecture does C&K Architecture specialise in? Our primary expertise serves multi-residential, aged care, health, hospitality, and commercial sectors. However, we do not limit ourselves in the type of projects commissioned. 4. What type of clients does C&K Architecture currently work with? C&K Architecture has a diverse range of clients including but not limited to property developers, aged care facility managers, and commercial and hospitality professionals. 5. What happens at the initial consultation? The initial consultation is for you to consider if we are the right fit for your project. We will discuss how your requirements align with our capabilities and extensive experience. You will be able to freely share your ideas and concepts and will be also be given the opportunity to ask questions and seek further clarification. 6. I have a project but don’t know where to start. How can you help? At the initial briefing, bring in examples of what you like about other buildings or developments. These can be sketches or images of inspiration. We can interpret your wish list and translate this into a great design. 7. I don’t have a site, can C&K Architecture help? As part of our development management service, C&K Architecture can assist with finding a suitable site for your project. 8. Can you help me obtain a permit for my development? C&K Architecture can arrange planning approval and building permits for your development. 9. Can I engage the services of C&K Architecture to finish design work if I have terminated the first architect’s commission? We are open to considering redesigning projects that have already commenced with another architect on a case by case basis. 10. Who will work on my project? A dedicated Project Leader will be assigned to manage your project from commencement through to completion. They will act as your representative on your behalf when dealing with third parties. 11. How long does the design process take? As each individual project has its own requirements and parameters, the design process turnaround varies. We’d be happy to discuss your requirements with you to give you an estimated time frame. 12. Can C&K Architecture design my new home build and/or extension? C&K Architecture mainly serves the commercial sector. However, we have experience in designing luxury residential homes. 13. What type of fees can I expect to pay? C&K Architecture can tailor a solution to your budget and requirements. After meeting to discuss your initial design brief we will provide you with a written fee proposal. Depending on the services quoted for, fees are usually worked out on a percentage or lump sum basis or a mixture of both. 14. Is C&K Architecture a member of the Australian Institute of Architects? 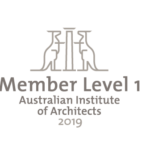 C&K Architecture is a long standing member of the Australian Institute of Architects and adhere to the institute’s standards.